But then isn’t Barrie’s argument stale. That’s not a criticism of Barrie, it is the situation. Just as we say that no one has figured out how the image was formed – which every student of logic knows is a big fat fallacy – we haven’t figured out anything better to say about the image except what it is not and to keep bringing up those chemical and physical details. The Rev. Andrew Dalton, a Legionaries of Christ priest who’s a shroud expert, told Crux that although the Church respects the autonomy of the scientific community, there are details that simply couldn’t have been forged centuries ago. Isn’t Colin Berry trying to figure out how the image was maybe formed by a forger with Thibault Heimburger reminding him about those pesky little details that “that simply couldn’t have been forged centuries ago.” Inés San Martín should be interviewing them. Here, right out of this blog, let’s look at two comments. “These aspects of the TS that the new model is supposed to match” are very important. Now, if you think that these facts are not proved, despite the many photos you have, I can’t add anything. 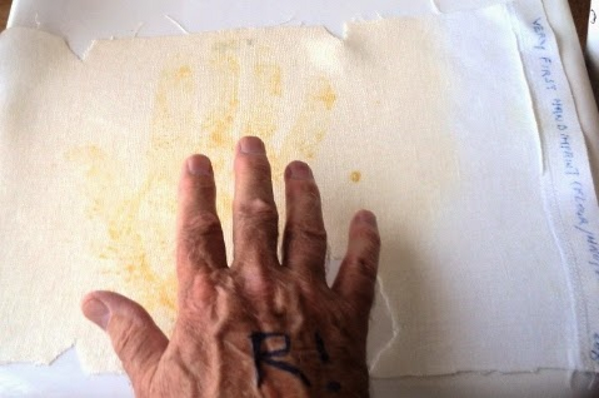 The ” ‘scattered colored spots” (also seen in Garlaschelli’s shroud) is only my description of your hand imprint. I’ll be in Turin until Sunday. Yes, it’s vitally important to match every tiny detail of the TS, as it existed when first produced. My new project will attempt to simulate in the kitchen the effect of centuries of subtle degradation on an image of unknown provenance, whether 700 or 2000 years old. Seriously, TH, one has to recognize the limitations of any attempts at model building. That’s what we scientists, as distinct from physicians, engineers, technologists etc do – we build models. Recognizing the limitations of models, we are concerned primarily with the principles, especially when there are so many who claim for example that a 200nm thick image in unexplainable by conventional science (wrong, it is). I am not trying to produce a facsimile copy of the TS (forgery Mark 2?) merely to show that its defining characteristics are consistent with medieval forgery. That’s as a counter to those pseudoscientific agenda-pushers who say they are not. (That’s my agenda – anti-pseudoscience). “Defining characteristic” must not turned into a trail (trial?) with no ending. Hat tip to Joe Marino for sending the Crux article along. I had a dream last night. For some reason I was dreaming of Charles Freeman and his painting theory. I remembered conversations with Isabel Piczek at her studio. 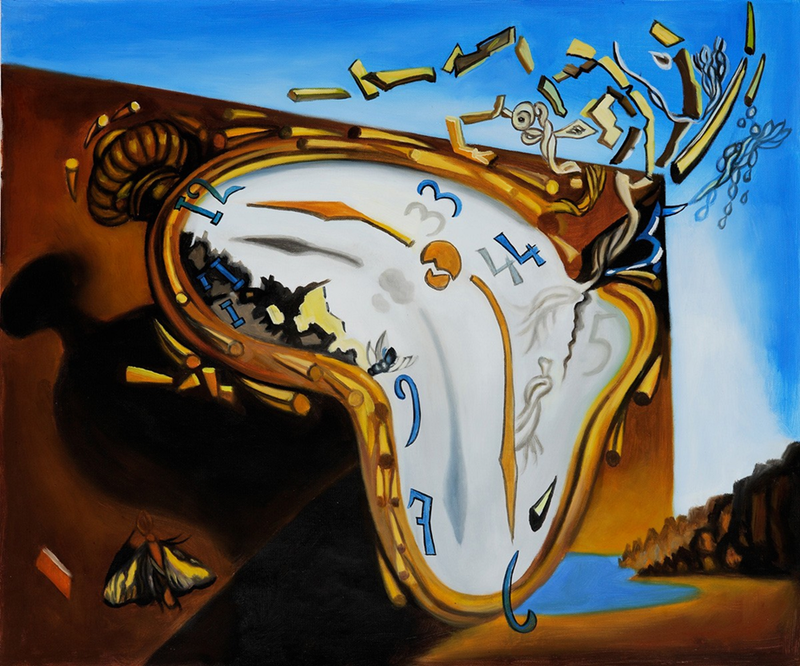 She always develops her paintings, which are large scale murals, with a "cartoon" as she calls it. I would call it a sketch that becomes the guide for where and how she would apply the paint. I assume that almost all artists start with an outline, cartoon or sketch. So in the case of Freeman’s theory, if all the paint has now flaked off, where is the outline? Where is the underlying sketch? First of all, dreaming of Charles Freeman and his painting theory is not merely a dream, it’s a nightmare. Anyway, when I first read about the shroud, I often read about how the image on the shroud had no outline. Isabel was often quoted and I found myself using the lack of an outline as an argument. Then one day, I was on Fifth Avenue along the edge of Central Park in Manhattan. There is along this famous avenue, where the sidewalk is as wide as the road, an area where local artists sell their works hanging on a fence or spread out on the pavement. Occasionally, you will find an artist painting portraits of tourists. I watched one such artist at work. He began with a smattering of seemingly random brush strokes with random colors from his palette. It was, for most of the time that he was painting, a work of pure chaos. Then the portrait emerged, slowly at first. The was the moment of I think I see the face. Then, it was, of course that is a face. 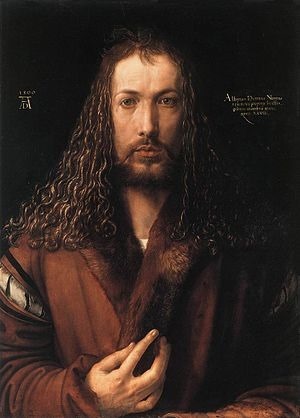 Finally, after maybe ten minutes, it was as hyper realistic as Albrecht Dürer’s self portrait, ca. 1500 AD (above). Watching this artist work was like watching the Harlem Globetrotters. No one shoots baskets like that. No one paints like that, without even a hint of an outline. The Shroud is a salutary shock, which invites you to not give up ever, and aiming high in life. Italian police are accustomed to “ageing” photographs of wanted gangsters to help them track down fugitive. Now they have reversed the process to generate a photofit image of Jesus Christ as a child, using as their starting point the adult man captured in Turin’s famous shroud, believed by many Catholics to represent the face of the crucified Christ. 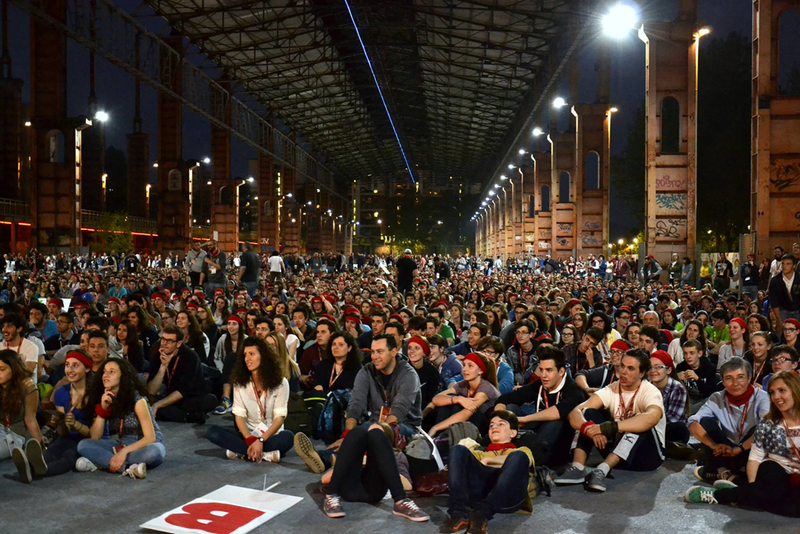 The computer-generated images were released to mark a two-month exhibition during which the 14-foot-long sheet, normally kept in a sealed container in a chapel next to Turin Cathedral, will remain on public display in the city. Pope Francis is due to visit . . . 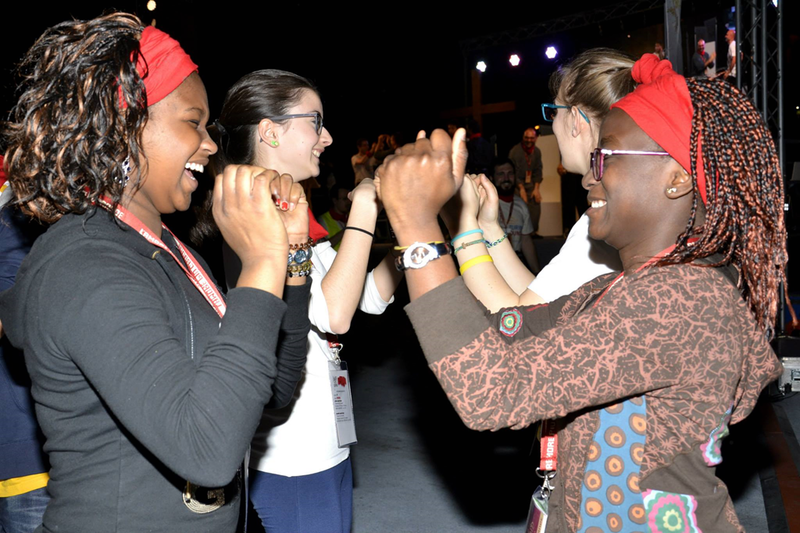 Seven thousand of Italy’s youth have arrived in Turin for a youth event of the Shroud Exposition, the White Night of Faith. Might tactile chemography prove to be the super-model? These are early days, but I’m (how shall we say?) quietly confident. No wine before its time. And don’t read Colin Berry’s posts in his blog before they have aged for a few days to match his unorthodox posting style. Now is the time. Fine wine indeed if you like something acidic. Give it time to breath. That doesn’t mean, of course, that you or I will like it. It is time to read Might this be how the Turin Shroud was faked, using medieval alchemy? Here it is folks: the best I can offer after more than 3 years of almost non-stop experimentation : Model 9 ("the nitric acid model"). Alternative name (afterthought, added 25th April): this new technique produces what might be called a "tactile chemograph". Maybe there was only one ever produced (the image that we now call the Turin Shroud). The tactile chemograph may be thought of as a forerunner of the photograph. (In both instances, one produces a latent image from a real person without harming them in any way, one that can then be developed in a bath (or vapour chamber) with the appropriate developing chemicals. The Turin Shroud. was this the world’s first and only tactile chemograph (think of it as a primitive ‘photographic’ negative, except for one tiny detail. Neither light not any other kind of elect6romagnetic radiation played any part in its production. It relied on the human touch (well, gentle massage actually). What finally persuaded this blogger to abandon thermal scorching, and move to liquid (or semi-liquid) imprinting? It was that paper that Joe Accetta PhD presented at the St.Louis gathering, 2014, in which he propsoed that the TS image had been produced by woodblock imprinting. Up till that time I’d always been sceptical re the use of any kind of liquid imprinting medium, considering that would risk a reverse-side image. But I concocted my own equivalent of Joe’s "oak gall" imprinting ink, in which the iron salts probably have a mordant action, as well as creating the ink by reaction with plant tannins. Here’s an image produced, substituting tannin-rich pomegranate rind extract for oak galls, supplemented with iron (II)sulphate. That ‘wet’ image was as good, if not better than anything produced by scorching. Yes. there was some reverse-side penetration, but might that not be minimized by suitable modification of technique, or simply by using thicker linen (and the TS linen IS thick, as Hugh Farey has observed). Once liquid imprinting was permitted as an option, then a host of new experimental options were opened up. Thanks Joe Accetta. You weaned me of those thermal scorches (but they were useful in other ways, showing that ANY negative imprint can model certain key features of the TS, notably negative image and 3D-enhancibility). Models in science do not need to tick all boxes simultaneously. One can run different models in parallel, each earning its keep in one or other respect, while patiently waiting for the day when the super-model suggests itself, one that combines the best features of its precursors, not only mine, but those of Garlaschelli and Accetta in particular. Hugh Farey and Adrie van der Hoeven added some useful and thought-provoking grist to the mill too, though whether they and the previous two would approve of the end-result is another matter. Might tactile chemography prove to be the super-model? We shall see. These are early days, but I’m (how shall we say?) quietly confident. Oh oh! You can’t put the cork back in, can you? Do go read Might this be how the Turin Shroud was faked, using medieval alchemy?